Arugula is a spring salad green used throughout the world. In Europe they call it “Rocket”. Popular as a peppery tasting salad green, arugula is a cool weather crop and is harvested in spring and fall at Sub Edge. With warmer weather the leaves become spicier. Storage: Store in a plastic bag in the refrigerator. Preparation: Wash arugula in plenty of cold water. If leaves are wilted, soak them in cold water for 10 minutes to revive them. Young tender arugula makes a great salad by itself or with some olive oil and salt and pepper to taste. If the peppery flavor of arugula is too strong, mix it in with other milder salad greens. 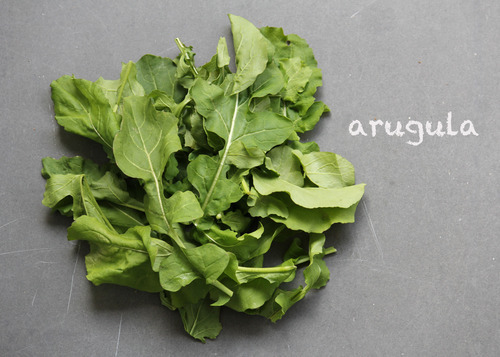 Arugula is a delicate green also be steamed, sauteed or added to sauces, pasta, rice or meat dishes at the last minute. Cook it lightly to retain its color and and delicate texture. Try substituting arugula for basil in your favorite pesto recipe.